COOKING: 5 minutes for the soup. 300 g of Squacquerone d.o.p. 2 slices of pancarre' cut into little cubes. WARM SOUP OF SQUACQUERONE OF ROMAGNA D.O.P. Whisk Squacquerone with milk, add slowly the oil and season with salt and pepper. Melt the butter in a small pan, add the pancarre in small cubes and fry briefly. Toast the toasts over low fire until they will get a beautiful golden colour. Transfer on paper towels and let them cool. Cut the tomatoes in their half, pour olive oil on a baking sheet covered with parchment paper, place the tomatoes and flavor them with thyme leaves. Bake in a preheated oven at 110° for 90 minutes. Let it cool. Heat the seed oil to 170° in a small pan, grease the sage leaves with a little cold olive oil, dip in flour and then fry for 2 minutes, toll they are well crispy. Remove cream cheese from the refrigerator, pour into a nonstick saucepan and place over low fire, stirring constantly. When the mixture will be a little warmed, pour it in dour bowls, add tomatoes comfit, fried sage, basil leaves and finally a dizzle of extra virgin olive oil. Mousse with chocolate, pears and Squacquerone of Romagna D.o.p. CREAM OF ROMAGNA SQUACQUERONE D.O.P. 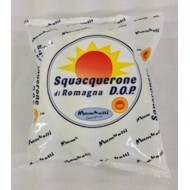 200 g Squacquerone of Romagna d.o.p. With the aid of a whisk, mix the egg yolks with the sugar until they are well blended. Boil the cream, add the egg cream and bake until the back of the spoon does not stick. Meanwhile, melt the chocolate in a water bath or a microwave. Pour in the melted chocolate on the still warm cream. Let cool and divide into four glasses. Put them in the fridge. Peel three pears removing the core, cut into cubes and marinate them with an emulsion of honey and lemon juice. Derive from the central part of the fourth unpeeled pear eight slices with a thickness of 2 mm. Heat the water and dissolve the sugar. Dip the slices of pear in the obtained syrup and transfer them to a baking sheet lined with parchment paper. Dry in oven at 130° for 2 hours.